I didn't really want to but I had to take a break from Sew.Quilt.Give. in July, despite the call for any star block I might want to make. I love star blocks and star fabric and stars in general. One secret ambition: to make a starry night quilt, something that's sort of a mash up of Van Gogh's painting and those deep space nebulae photos. These Shattered Glass blocks come from this tutorial from the Undercover Crafter. These are a lot like theses blocks I made for the Craftsy 2012 BOM (which I'm still working on...). I wasn't so sure that a whole quilt out of the Craftsy blocks would work, but those blocks are much more regular than these. 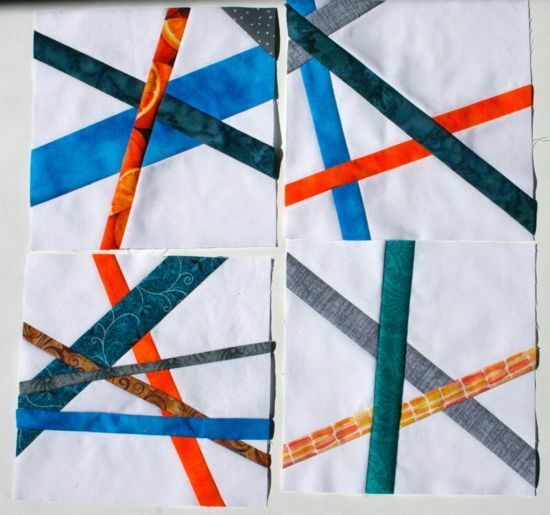 Really looking forward to seeing how the full Shattered Glass quilt comes out! Speaking of finished quilts, the Sew.Quilt.Give. blocks from April (mine are here) are all quilted and assembled! Check out the finished quilt! For once, my blocks don't stick out like a bad sunburn. And, yes, I'm working on the March SQG quilt. An update on that coming soon.